With the nation's ruling military regime loosening its grip, Myanmar (also known as Burma) is attracting lots of attention. In 2011, a new government began implementing reforms, including freeing hundreds of political prisoners, and holding credible elections -- during which pro-democracy leader Aung San Suu Kyi's opposition party won a landslide victory. That led to Secretary of State Hillary Clinton's landmark visit in late 2011, followed by President Barack Obama's in November 2012. The warming of relations and easing of U.S. sanctions has helped boost Myanmar onto nearly every travel hot list. Cruise providers -- many of them river operators -- have been scrambling to put together itineraries that call on Myanmar's largest city of Yangon (also known as Rangoon). Premium and luxury lines are also including Yangon on select Southeast Asia and world cruise itineraries. Why the rush? Yangon (pronounced "Yangoon") is emerging from its bell jar. But the city doesn't suffer from the glut of modern high-rises and shopping malls that choke other Asian capitals. Many residents wear traditional sarong-type clothing, and women still embellish their faces with a beige paste called thanakha, a traditional makeup and sunblock made from ground tree bark. The region's residents generally are welcoming and curious about visitors. The city features an intriguing conglomeration of crumbling British colonial architecture, a few refurbished buildings hinting at the city's glory days and a smattering of new construction. Impressive Buddhist pagodas and other religious sights are on display in Yangon itself and in the old imperial capitals of Bagan, Bago and Mandalay. Plus, there's interesting food to be tasted and handicrafts to be bought, particularly in the city's sprawling covered market. The city began in the early 11th century as Dagon, a small fishing village. It was founded by the Mon people, one of many ethnic groups in the country. After two 19th-century Anglo-Burmese wars, the British seized Yangon and all of lower Burma in the 1850's. They turned Yangon into their seat of power in Burma, building an infrastructure that was said to rival London at the time. The city fell to Japan in World War II and entered years of political turmoil following independence in 1948. The military took power in 1962, and the repressive regime only began to relinquish control in 2010. Most cruises are timed to call on Yangon during its dry season, which runs from December to March. Temperatures can reach the low 90's during those months, dropping into the mid-60's at night. Tourism infrastructure is still developing in Myanmar, so a cruise ship is the perfect way to ensure your travels are comfortable. Not every ship will be able to dock in the heart of Yangon, though. The river port is about a four-hour journey through the Irrawaddy River delta, then up one of its tributaries, the Yangon River. Larger ships are restricted to the Thilawa deep sea port, about 15 miles south of Yangon. Myanmar or Burma? Yangon or Rangoon? The British referred to the country as Burma, a name derived from the majority ethnic group, the Burmans. 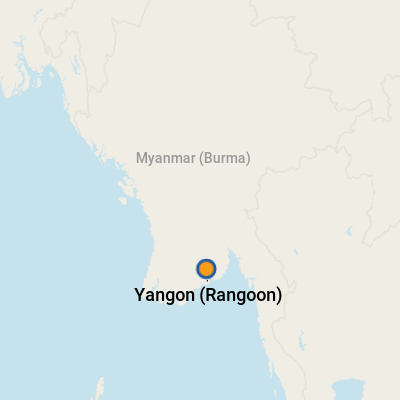 They called its major city Rangoon, most likely a misunderstanding of "Yangon." The military regime changed the country's name to Myanmar and the city's name back to Yangon. However, neither the opposition party nor the U.S. State Department recognizes the nation as Myanmar. In the city: Ships up to 613.5 feet can dock in the heart of Yangon, at Bo Aung Kyaw Jetty (or, in some cases, nearby Nanthida Jetty). This concrete pier is located at the foot of Bo Aung Kyaw Street, just below Strand Road. (Look for the label "Myanmar Port Authority" on Google Maps.) From dockside, it's about 500 feet before you reach the gate of the port on Strand Road. If you go out the gate on your own, be prepared to show your ship ID card to re-enter the port. The port offers no terminal or services. Thilawa Port: Bigger ships, up to 853 feet, have to dock at this deep-sea port 15 miles south of the city. (Plans are under way to expand capacity to handle ships up to 984 feet.) It's about an hour's drive to reach the center of Yangon. The port has no services. Docking and sailaway times must conform to the tides, and tide tables are only released a month in advance, so schedules may vary a bit from advance itineraries. If you're docked in the city, colonial Yangon awaits just outside the port. Head left on Strand Road from Bo Aung Kyaw Jetty, and in five minutes, you'll encounter the Strand Hotel. Head straight up Bo Aung Kyaw Street, and you'll pass a variety of retail outlets and colonial buildings. On the next major street east of Bo Aung Kyaw, about a 10-minute walk away, is Monsoon restaurant, a favorite of expats and travelers. Clustered around the gate of the port are numerous street vendors, selling tea and snacks to locals using the nearby ferry services. Taxis can be hailed at the port gate, and kids hawking postcards probably will pounce the minute you hit the street. If you're docked at Thilawa, you're pretty much isolated, but taxis are available at the port. Yangon is generally safer than many large cities, but take the usual precautions when walking at night, and be sure to count your change carefully -- particularly if you visit a money-changer. When visiting religious sites, modest dress (shoulders and knees covered) is required for both men and women. You will also have to remove your shoes and socks before entering. Water is unsafe to drink, and be cautious about ice cubes, as well, unless you're at a reliable establishment. Think twice about eating street food; sanitation is iffy. Toilets are usually of the squat variety (aside from those at hotels), and you'll need to bring your own toilet paper. The U.S. State Department warns, "It is illegal to take pictures of Burmese officials and of certain buildings, such as military installations and government buildings. ...Do not photograph or videotape the military or police, or anything that could be perceived as being of military or security interest -- such as bridges, airfields, government buildings or government vehicles. Burmese authorities might interpret these actions as being provocative and may question and/or arrest you." Got that? Traffic lights, including the one just outside the port at Strand Road and Bo Aung Kyaw Street, might not provide enough time for a pedestrian to cross the street. Proceed with caution. Street dogs are ubiquitous, particularly around the port, but seem very timid for the most part. Just keep an eye out for their little "gifts," especially at night when outdoor lighting isn't the best. You'll probably also want to avoid stepping in the orange splotches left when betel nut chewers spit. Beware of "beer gardens" you might find listed in guidebooks. The women there might be for sale. Want more info? Here's a detailed guide to cultural "dos and don'ts" from the Myanmar Ministry of Hotels and Tourism. On Foot: If you're docked in the city, you can explore the colonial area near the port, as well as Chinatown and the Indian area. We even walked from the covered market back to our ship (a leisurely one-hour stroll). Sidewalks can be very irregular or nonexistent, so wear sturdy walking shoes, and consider carrying an umbrella to shade yourself from the sun. By Taxi: Taxis are plentiful and relatively inexpensive. Just don't expect luxury. Old Japanese cars come to Myanmar to die, so there are plenty of raggedy Toyotas, with windows that might not work or grungy decor. Seatbelts? Ha! Rates are negotiated, not charged by the meter -- so make a deal before you get in. Hotel or restaurant staff can help. By Bus: More than 300 public and private bus lines operate an estimated 6,300 buses around the city. Most are crowded and not air-conditioned. Our advice: Stick with taxis. There are no cash machines in Burma, and foreign credit cards are not accepted (with the exception of some upscale hotels, which tack on a surcharge). If needed, you can exchange money at banks and official money-changers. For currency-conversion figures, visit www.oanda.com or www.xe.com. Your $50 and $100 bills will garner the best rates. However, in most instances, market vendors, taxis, restaurants and other entities dealing with tourists will be happy to accept U.S. dollars, but any U.S. bills must be pristine, unmarked and uncreased. We even saw a vendor balk at accepting a bill that had a slight curve from being kept in a wallet. Bring plenty of small bills if you don't want to receive kyat, the local currency, as change. One of our fellow passengers tried to make a purchase at a supermarket that didn't take dollars. The store manager walked him down the street to a money-changer and helped him exchange for the right amount of kyat. You might be approached on the street by people offering to change money; don't take them up on their offers, as it's against the law. Myanmar's official language is Burmese, although the population speaks more than 30 different tongues. Children learn to read and write English in school, but people tend to be shy about using English because they don't speak it well. Those involved in tourist-related businesses will speak at least some English. Many vendors at the market will let their calculators do the talking. Two language hints: The letters "ky" are pronounced like a cross between "ch," and "j," so the local currency, the kyat, is pronounced "chat." The letters "th" are individually voiced, so they don't make the unique sound they do in the English language. Some words to know: min ga la ba (hello), kyeizu pyu yue (please) and kyeizu tin ba de (thank you). Because most ships call on Yangon for one to two nights, there's an opportunity to eat dinner, as well as lunch, ashore. While street food is abundant, questionable hygiene makes it a risky choice. You can get a taste of local cuisine at a number of restaurants, though. Mohinga is a classic Burmese dish. It's a hearty soup of rice vermicelli, fish stock, onions, garlic, ginger, lemongrass and other ingredients, usually served with boiled eggs. Ngapi, a fermented fish paste used extensively in Burmese cooking, gives it a fair amount of funk. For many, it's an acquired taste. Another popular dish is lahpet thohk, pickled tea leaf salad, which delivers a wonderful variety of textures, including the crunch of deep-fried peas, peanuts and garlic. Fresh slivers of tomatoes, ginger, dried shrimp, fish sauce and lime also are added. There's a tendency for dishes to be delivered to the table haphazardly -- main courses before appetizers or everything all at once -- unless you clearly specify when you order. At better restaurants, the waiters will ask how you'd like the dishes served. All the restaurants listed below, except for Monsoon, will require taking a taxi from the riverfront area. Some are located in more residential areas outside the city center. Myanmar is known for its lacquerware, which appears as everything from inexpensive bracelets and boxes to pricey, intricately decorated furniture -- all of which can be found at Bogyoke Aung San (formerly Scott) Market. Carved sandalwood, in the form of Buddhas and other religious art, and jade also are popular. Interesting textiles make another good choice. Sip one of the signature cocktails, like a Strand Sour (Mandalay rum, lime juice, sugar syrup and Angostura bitters), amid restored colonial splendor at the Strand Hotel bar. If you're lucky enough to be in port on a Friday night, drinks are half price.